The market has stayed surprisingly resilient in the face of rupee hitting new lows and oil prices spiraling up, but many fear trouble is certainly in store for equity investors. The rupee turning up as the worst performing currency among emerging markets, shedding over 12 per cent value in 2018, may turn the heat on corporate India in the coming quarters. Experts foresee a sharp rise in the cost of foreign debt servicing and higher input cost for many companies, leading to a squeeze in margins. This does not augur well for the market as it could trigger earnings downgrades. Both equity and debt markets are going to be hit when analysts unleash a wave of earnings downgrades. The second quarter (2QFY19) is drawing to a close with hardening foreign exchange market, crude oil and yields on fixed income bonds. This may prod analysts to revise down earnings, considering that the rupee has depreciated nearly 10 per cent during the quarter alone and the rising crude oil would raise input prices for many industries, dealing them a double whammy. Mark-to-market provisions on forex loans—after currency rate adjustment—and higher input costs would stretch companies' cashflows, or working capital, thereby denting their margins. The hardening of 10-year yields and the uptick in corporate paper would hurt investors in bond funds, since net asset values (NAVs) will be marked down after bonds are valued with benchmarks. Rich stock valuations, more than 2.5 standard deviation from long-term mean Nifty price-earnings (PE), spectre of margin contraction and uncertainty surrounding elections do not bode well for the bull party. In fact, all the gains in rupee terms over the last six months have been negated by currency depreciation, and foreign investors have not seen any gain during the calendar year. Though India VIX shows calm despite a general nervous mood in the Indian market, according to analysts, this might indicate complacency as India VIX is based on the Nifty, which has largely withstood the selling pressure on the back of a few major bluechip outliers. “ECB (external commercial borrowing) and structured debt borrowers are in a soup; the impact will unravel in corporate margins squeeze and mark-to-market losses and then in demand contraction on suppressed purchasing power,” an analyst with a leading foreign brokerage said. “Fortunately, it’s happening around this time of the year when cyclical positives will play favourably for food inflation,” he said. 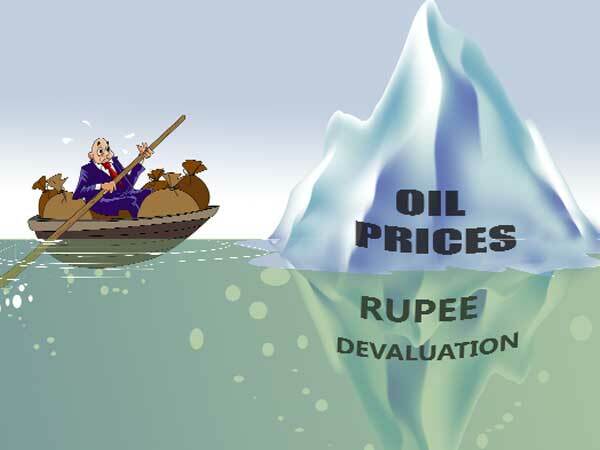 Thanks to India’s high dependence on imports of crude oil to meet domestic demand, an increase in crude oil prices increases the current account deficit, weighing down the rupee. The rising oil and depreciating rupee increase regulatory risks on public sector oil & gas companies. India’s economy is vulnerable to oil supply ‘shock’ and its macro position would worsen if oil prices were to shoot above $80 a barrel. Kotak Securities, in a report, says that a $10/bbl change in crude oil prices results in a 50 basis points impact on CAD/GDP and 30 bps impact on inflation. It assumed 2.8 per cent CAD/GFD at $72.5/bbl dated Brent crude price and 4 per cent average CPI inflation for FY19. The report projects gross under-recoveries of Rs 46,000 crore versus the government’s provision of Rs 26,500 crore. Gross fiscal deficit (GFD) could rise if the government were to reduce taxes on diesel and petrol to mitigate the impact of higher oil prices, says the report. Global oil prices have risen by about 10 per cent over the past two weeks on declining inventories and faster-than-anticipated decline in Iranian exports as the countdown to the enforcement of US sanctions has begun. Forex risk is another trouble front for companies. Most Indian companies with overseas debt have not adequately hedged their foreign currency risk, making them vulnerable to any sharp movements in the rupee. Companies in sectors like power, metals and mining as well as oil & gas are the worst hit since they have the highest borrowing from the overseas market, accounting for almost half the foreign currency borrowings by domestic firms. Analysts said the rupee will have a significant impact on the earnings of companies with large foreign debt. The stocks of these companies are also likely to de-rate in the medium-term. Commercial borrowings have shot up by 30 per cent and making them the largest component of external debt, with a share of 38.2 per cent. A study by credit ratings agency India Ratings says out of 100 companies holding Rs 19.5 lakh crore of debt abroad—as of March 2016—54 companies, with Rs 14.5 lakh crore exposure, were vulnerable, given that only 35 per cent of their balance sheets was hedged. Of those 54 companies, 42 holding Rs 8.9 lakh crore in foreign currency debt could see their credit profiles “weaken substantially” should the rupee weaken by 10 per cent. This shows the magnitude of the problem the companies have in hand. The high cost of hedging and the range-bound movement in the rupee over the last three years have deterred companies from fully hedging their forex exposure. Reports say external borrowings of 60 companies are set to mature in the next six months and out of this 37 will mature by December 2018 and the rest by March 2019. While the Sterling Biotech has ECBs worth $206.5 million maturing in March 2019, BASF India ($185 million), SAIL ($150 million) and Dr Reddy’s Laboratories ($150 million) have ECBs maturing between November 2018 and end January 2019. Smaller companies like Motherson Sumi, NRB Industrial Bearings, Sim-plex Infrastructure, Asahi India Glass, TVS Srichakra, Sundaram Fasteners, SAIL and 63 Moons Technologies, among others, have ECBs falling due in the next three months. Over the next six months ECBs of REC, Adani Power, Electrosteel Steels, Hindustan Oil Exploration Company, Fortis Healthcare and Lanco Infratech are set to mature. An Axis Capital reports, however, says 53 per cent of forex liabilities of BSE500 companies have a natural hedge in the form of forex revenues. Every dip in the rupee is going to put additional pressure on companies having ECB exposure, as they will have to provide for, or mark-to-market, the fall in their books. The trouble for India Inc is not just from the rupee and oil. Experts believe India’s macroeconomic landscape remains challenging. Many indicators like current account deficit (CAD), fiscal deficit, bond yields, indirect tax collections and foreign flows are worsening along with the challenging external environment. “Earnings growth has been a big challenge for the domestic market. Over the last two years, earnings growth for stocks has been patchy and inconsistent. Q1FY19 was the first quarter where market-wide earnings growth (ex-PSU banks) clocked a growth of 20 per cent. A pick-up in earnings can overshadow the other negatives and support the market. But the downgrades cycle in FY19 is just like it was in prior years,” Edelweiss said in a report. It feels that there could be a 10 per cent drop in the market as synchronous global growth of CY16 and CY17 is now behind us. “Global economic growth is now fractured and is plagued with risks. The US has entered a late cycle, indicating peak growth and earnings dynamics. An intensifying dollar liquidity vortex is squeezing emerging markets one after the other and may create more problems if trade wars escalate,” Edelweiss said. CAD will continue to be under pressure as imports have been growing faster than exports. Thus, the benefit of depreciating currency will take a while to play out. FY19 earnings estimates have been cut after the Q1FY19 results. If Q2FY19 delivers below the line results, the market may revise down full year FY19 earnings estimates. “After eight quarters of downgrades, Nifty earnings in Q1FY19 somewhat matched the expectations although dragged down by corporate lenders. However the downgrade cycle in FY19 seems to be similar to earlier years,” Edelweiss said. “At nearly 20 times one-year forward earnings, the Nifty Index (11,600) is trading at rich valuations, creating a poor margin of safety. We expect headline indices to face increasing odds of a deep correction of 10 per cent or more or be range-bound at best,” Edelweiss said. When it rains, it pours, eh? Investors’ losses and worries are piling up with more and more bad news flowing from corporate India. Strong opportunities are present in the capital markets today. The earnings season is expected to be good, which will witness a rise in profits for companies. Whether the real estate market remains bullish or bearish, NRIs prefer a place back in India - not just for investment returns but also to remain rooted in their country of origin. The time values in both call and put options, seen right before the budget, clearly indicated heightened hedging activity is going on in the market.